The offers are valid on all leading brands including Makita, Black & Decker, Karcher, Homeworks and more. The promotion is valid on a selection of products from Outdoor Lifestyle, Gardening, Home Living, Paint & D�cor, DIY, Automotive and Pet care products. 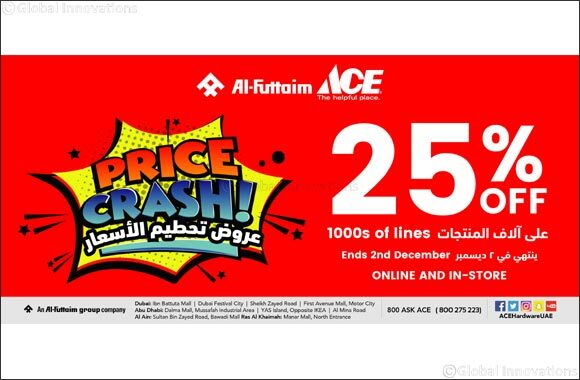 Al-Futtaim ACE stores offer a wide selection of Outdoor Lifestyle, Gardening, Home Living, Paint & D�cor, DIY, Automotive and Pet care products. With more than 33,000 great products, Al-Futtaim ACE offers world-class brands such as Karcher, Black & Decker, Makita, Clark + Kensington, Weber, Gardena and Leisuregrow.